A podcast for the church misfits & outcasts. Rev. Emmy Kegler is the pastor of Grace Lutheran Church in Northeast Minneapolis (gracenempls.org) and the founder and editor of Queer Grace, an encyclopedia of online resources around LGBTQ life and faith (queergrace.com). She pastors a small servant-hearted neighborhood congregation in Northeast Minneapolis focused on feeding the hungry and community outreach, and is co-leader of the Queer Grace Community, a group of LGBTQ+ Christians in the Twin Cities who meet for worship, Bible study, and fellowship. . . . Connect with Emmy on Instagram, Facebook & Twitter and at emmykegler.com. Pre-order Emmy's new book, One Coin Found: How God's Love Stretches to the Margins here. . . . Connect with me on Instagram, Facebook & Twitter @baileyjowelch and at baileyjowelch.com. . . . Don't forget to subscribe and leave a review if this content is encouraging you or positively impacting you in any way. If you share on social media, please use #MakingRoomOnThePew and tag me! Kat Armas is a writer and podcaster who's passionate about theology, coffee, and the ways the two intersect. She is currently living in Los Angeles, California, and is pursuing a Master of Divinity and a Master of Arts in Theology at Fuller Seminary. Kat and her husband own a coffee roasting company. Their goal is to provide the best cup of joe, while building deep and meaningful connections with farms and communities overseas. . . . Connect with Kat on Twitter @kat_armas and at katarmas.com. Listen to her podcast called, "The Protagonistas" here. Grab a bag of coffee from Kat's coffee roasting company here. . . . Connect with me on Instagram, Facebook & Twitter @baileyjowelch and at baileyjowelch.com. . . . Don't forget to subscribe and leave a review if this content is encouraging you or positively impacting you in any way. If you share on social media, please use #MakingRoomOnThePew and tag me! Rev. Sarah Welch-Pomerantz is the first woman pastor under 40 and the first queer pastor of Community Church of Cedar Grove. She lives with her wife, Bailey, and their two cats in northern New Jersey. Join us as we talk about being a queer woman pastor, Sarah's path to ordination, and how to have positive interfaith conversations. . . . Connect with Sarah on Instagram, Facebook & Twitter and at revsarahpomerantz.com. . . . Connect with me on Instagram, Facebook & Twitter @baileyjowelch and at baileyjowelch.com. . . . Don't forget to subscribe and leave a review if this content is encouraging you or positively impacting you in any way. If you share on social media, please use #MakingRoomOnThePew and tag me! Steve Austin was a pastor when he nearly died by suicide. He is the author of two Amazon bestsellers, From Pastor to a Psych Ward, and Catching Your Breath. Join us as we talk about mental health, fear-based theology, and . . . Connect with Steve on Instagram & Twitter @iamsteveaustin and at iamsteveaustin.com. Grab Steve's latest book, Catching Your Breath here. . . . Connect with me on Instagram, Twitter, and Facebook @baileyjowelch and at baileyjowelch.com. . . . Don't forget to subscribe and leave a review if this content is encouraging you or positively impacting you in any way. If you share on social media, please use #MakingRoomOnThePew and tag me! Manda Carpenter is a writer and foster parent living with her husband Eric in Chicago, IL. Join us as we talk about the hard and beautiful ministry of foster care, how to survive your evolving theological beliefs, and who Manda thinks the Church needs to get better at welcoming in. . . . Connect with Manda on Instagram, Facebook & Twitter @mandacarpenter and at mandacarpenter.com. Get involved with #MonthlyLettersOfEncouragement here. Grab Manda's new devotional, Space: An Invitation to Create Sustainable Rhythms of Work, Play, and Rest here. . . . Connect with me on Instagram, Facebook & Twitter @baileyjowelch and at baileyjowelch.com. . . . Don't forget to subscribe and leave a review if this content is encouraging you or positively impacting you in any way. If you share on social media, please use #MakingRoomOnThePew and tag me! B.T. Harman is a writer and advocate for compassionate, grace-filled relationship--even when there are disagreements about fundamental ideas and theology. B.T. is the writer of Blue Babies Pink: A Southern Coming Out Story and the creator of Harbor, an online support group for Christian parents of LGBTQ children. Join us as we discuss being a gay Christian, how to foster grace-filled relationships with those we fundamentally disagree with, and how to better support the parents of LGBTQ kids. . . . Connect with B.T. on Instagram & Twitter @bt_harman and at btharman.com. Want to read more of B.T. 's story? bluebabiespink.com Interested in the Harbor program? harborhere.com . . . Connect with me on Instagram & Twitter @baileyjowelch and at baileyjowelch.com. . . . Don't forget to subscribe and leave a review if this content is encouraging you or positively impacting you in any way. If you share on social media, please use #MakingRoomOnThePew and tag me! Shannan Martin is a writer and speaker living as a grateful neighbor with her jail-chaplain husband, Cory, and their four funny children in Goshen, Indiana. Join us as we talk about how to neighbor well, the problem with the American penal system, and being church misfits. . . . Connect with Shannan on Instagram & Twitter @shannanwrites and at shannanmartinwrites.com. Grab Shannan's new book, The Ministry of Ordinary Places: Waking Up To God's Goodness Around You here. . . . Connect with me on Instagram & Twitter @baileyjowelch and at baileyjowelch.com. . . . Don't forget to subscribe and leave a review if this content is encouraging you or positively impacting you in any way. If you share on social media, please use #MakingRoomOnThePew and tag me! 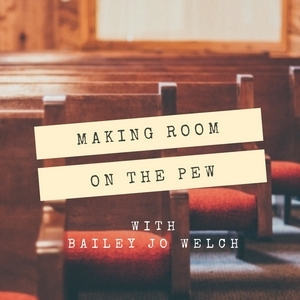 Hosted by writer Bailey Jo Welch, this is a podcast for the church misfits and outcasts.